Having celebrated 60 years as a member of the Craft, Tom Blackburn joined with other companions of Holy Royal Architect Chapter No 314 to celebrate his jubilee in the Royal Arch. The chapter was honoured by the presence of the Deputy Grand Superintendent Paul Renton, accompanied by Assistants to the Provincial Grand Principals, Mike Threlfall, Chris Butterfield, Tony Hall and Duncan Smith. They were supported by the Provincial Grand Director of Ceremonies Paul Hesketh and Provincial Deputy Grand Director of Ceremonies Barrie Crossley and other acting Provincial grand officers. In attendance were chapter members and colleagues that included, Peter Hosker, Bill Huck, Bill Seddon, Peter Elmore and Ian Cuerden. The first principal Steve Bolton, welcomed all the visitors and with his co-principals, Malcolm Berry and Robert Irwin, opened the chapter. The administrative business of the evening was quickly completed before Paul Hesketh entered to announce the presence of Paul Renton who entered in due form accompanied by grand and Provincial grand officers. Steve had the pleasure of welcoming Paul, offering him the sceptre of his office. Paul thanked him for the privilege of taking the first principal’s chair and on this occasion, notionally accepted it. In view of Tom having recently celebrated 60 years in the Craft with a cast of ‘1,000s’ in attendance, and the potential for repetition of previously heard information, Paul decided that the occasion demanded something different. Moving away from the usual celebration arrangement he introduced a version of the radio programme, ‘Desert Island Discs’, with Tom being the guest castaway and Paul himself taking the role of presenter. A projector and screen had been set up and having ensured Tom was seated in a comfortable position in full view of the screen, Paul commenced with a photograph of Tom rock climbing in his younger years. This was followed by an image of a radio and pictures of Roy Plomley, the originator of the radio programme and the current presenter Kirsty Young. This was accompanied with the sound of the programme signature tune, ‘Sleepy Lagoon’ pervading the chapter. For those not familiar with the programme, Paul briefly explained the format regarding the selection of eight recordings, a book and a luxury item for Tom to take with him to his desert island. Everyone now on board with regards to the format, Paul introduced ‘The Grand March from Aida’ by Verdi as the first record selected by Tom. Tom in turn, said it reminded him of military service and ‘square bashing’, an attribute he felt served him well in his future position as a deputy DC. In between recordings further slides were shown that, in this instance, were images of cuttings from the Lancashire Daily Post from the time of Tom’s birth in July 1932, interspersed with music of the era. Recording number two from Tom’s selection was ‘Norwegian Dance’ by Grieg. This reminded Tom of a trip to Norway and having to eat what he considered to be basic food. Mention was made of marmalade steam pudding wrapped in hessian. Somehow, use of Tom’s vest as a substitute for the hessian came into the conversation. Recording number three, ‘When the Saints go Marching In’, served to remind Tom of his father-in-law who, as a seaman, had many adventures rounding the ‘Horn’ and when he was at home, being with him looking at the tall ships docked in Liverpool. This was interspersed with images of Tom Blackburn & Sons and mention of the difficulties the business had as a manufacturer of farm equipment. Recording number four, ‘The Lord Bless You and Keep You’, by John Rutter, was music that Tom loved to hear as it brought back many memories. Memories that were again stirred when it was played at the recent wedding of Prince Harry and Meghan. Another of Tom’s favourites was recording number five, the ‘Hungarian Dance’ by Johannes Brahms, a spritely and joyful piece of music that reminds Tom of the happy times he has entertaining his grandson. 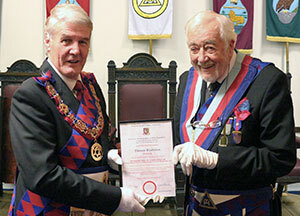 It also reminded him of 1968 when he was exalted into the Royal Arch, an Order he was not encouraged to join too early. A selection of music from 1968, that started with Louis Armstrong singing, ‘What a Wonderful World’ filled the chapter. Tom’s next selection was ‘Cavatina’, the theme from ‘The Deer Hunter’. It was a tune that took Tom back 45 years to a time when he was stalking in Scotland. He claimed to have ‘bagged’ a few clearing the area of crossbreeds and over many seasons, ended up with a herd of excellent stock. Listening to recording number seven, ‘In the Mood’ by Glen Miller, Tom said it reminded him of his youth, attending the late summer races in the Isle of Man that involved the mandatory imbibing of copious quantities of alcohol. There followed a selection of music from 1975, the year Tom became the first principal of Holy Royal Architect Chapter. This included music by the Bay City Rollers, Rod Stewart and Windsor Davies with Don Estelle. The final record ‘Gabriel’s Oboe’ was another of Tom’s favourites reminding him of his service to the church. In the spirit of Desert Island Discs, Paul then enquired of Tom, what philosophical book would he like to take with him to accompany the works of William Shakespeare, that would already be there. He received the popular reply, a copy of the Bible. Anticipating his response to the next question, Tom forwent the free choice of a third book. Paul then posed the question as to what luxury item Tom would like with him during his time in isolation. Taking poetic licence as to the meaning of the term, ‘item’, Tom replied: “A clay trap, and obviously, a shotgun complete with an unlimited supply of clays and ammunition!” Apparently, he was anticipating that, should his wish be granted, there would soon be little left flying around for him to maintain his eye and arm coordination. Quickly moving on Paul asked Steve Bolton, in his capacity as the Preston Group Chairman and the first principal of the chapter to read the celebration certificate from the Grand Superintendent Tony Harrison who, most certainly sent it with his best wishes for the occasion. Paul then had the pleasure of presenting Tom with the celebration certificate, wishing him continued good health and enjoyment. There then followed sustained applause from all present. Later in the evening, Bill Huck had the pleasure of proposing the toast to Tom’s health. Having already proposed the toast to his good friend’s health at his recent celebration of 60 years membership of the Craft, Bill admitted there would be some repetition of what he was going to say. However, it would be repetitious because it was worth repeating. He commenced by referring to Tom as a ‘special man, a special man with an engineering background’. He referred to Tom’s company that had many facets including the design of rail car fittings, the casting of anchors and the manufacture of small ships fittings. He moved on to Tom’s time in the haulage business with tales of him driving seven-ton waggons carrying 12 ton loads with the constant need for a heavy right foot on the brakes. Continuing, Bill brought up the subject of Tom’s sporting life beginning with the motor sport of rallying. With a twinkle in his eye, he reminded Tom of the time he wrote off one of his cars, having fallen asleep at the wheel. However, this did not stop him becoming a works driver for Triumph, wearing a leather helmet and little else for protection. As his onetime navigator, Bill considered Tom a fast but safe driver. Moving on, he quickly skipped over Tom’s pre-nuptial eye for the ladies by disclosing his fishing exploits and the extensive drinking that necessarily accompanied that activity. It was at this point that several references were made to Tom’s love of damson gin. Acknowledging his skills with the rifle, reported earlier by Paul, Bill confirmed the restoration of a mixed herd of deer to pure stock and to the accuracy of his shooting. Much to the amusement of the companions, Bill referred to copies of photographs showing Tom in his earlier years, apparently nodding at a function whilst the ladies were looking at the camera and as an alternative, a photograph of him dressed as a Roman soldier. Before inviting the brethren to rise and acknowledge the toast, Bill closed by saying what a privilege it had been to propose the toast to Tom’s health, now for the third time. In response, Tom congratulated Bill on his extensive and detailed research about him. He confirmed that his friendship with Bill continues to be most welcome and cherished. He well remembers their time together in competitive motoring and the enjoyment that had brought. Referring to the Desert Island Discs earlier, he said it was most enjoyable and brought back many memories. He did confide that he was surprised by it, as he thought the programme had earlier moved up market with its selection of clientele. He confessed that, having only served two years in the post of deputy DC, in his opinion, he had not done a great deal. However, he did recall attending 36 chapters and witnessing 37 different rituals in the process. Although his main contribution was to the Craft, he did admit to finding his time as a member of the Royal Arch varied and interesting and continues to do so. He closed by thanking everyone for their support at this celebration, support he found quite humbling. It was a feeling he found quite strange for a former deputy DC! He sat down to an extended standing ovation that resounded round the dining room. As a memento of the occasion, the evening closed with Steve Bolton presenting Tom with a menu card signed by all present.